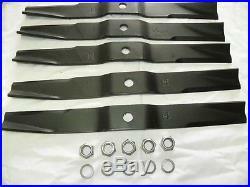 This sale is for a set of five (5) replacement Caroni Finish Mower Blades with (5) Nuts and (5) Washers original equipment blades, fits Model TC910 - 7' 7 finish mower. Blade is 20-1/4 inches long, 2" wide and 1/4" thick amd are made in Italy, not cheap knock offs. These are high lift blades with a 3/4 (19mm) mounting hole. In addition to fitting the Caroni mowers these blades are also used on mowers from other Italian manufacturers. We stock a complete line of replacement mower parts for Caroni and other manufacturers such as Sovema, Techma, Sicma, First Choice and more. DNE-59006200 Blade, DNE-1291 Nut, 1801 Washer. Please call before you come to verify items are in stock, we try to keep all advertised items in stock at all times. But we would hate to have you visit us and not have the item you are looking for when you get here! We now take Discover Card and American Express Too! Personal check orders held 10 days or until check clears. Your complete satisfaction is important to us. The item "Caroni Mower Blade Kit fits TC910 7'7 Finish Mower Blades, Nuts and Washers" is in sale since Wednesday, May 14, 2014. This item is in the category "Business & Industrial\Heavy Equipment Attachments\Mowers & Mower Conditioners". The seller is "dnequipmentparts" and is located in Mount Orab, Ohio. This item can be shipped to United States.